The MCP was originally organized in 1939 and produced several plays through 1941. They were dormant until 1952 when they presented "The Petrified Forest" during the 1952 off-season of the Manistee Drama Festival summer stock program. The MCP produced its first musical, "Guys & Dolls" in 1963. In 1964 it was decided to end the summer stock program that used outside professional talent and to start a year-round season of locally produced shows, including musicals. The Manistee Civic Players absorbed the Manistee Drama Festival into their organization. In 1974 the MCP leased the theatre portion of the building from the City of Manistee and took on the management of the entire structure until 2007. 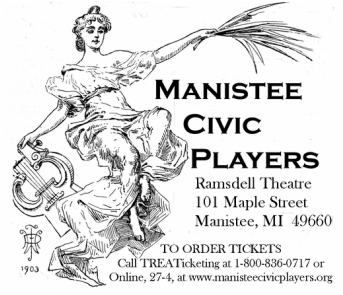 Today the Ramsdell Theatre is owned and operated by the City of Manistee and the Manistee Civic Players produce a five show season and rent an office space from it. For many years, the MCP was instrumental in restoring and preserving the Ramsdell, the ‘Jewel of the Midwest’, for residents and visitors alike, and they take pride in continuing to do so. During the major restoration period of the early 1990's thru 2007, the Manistee Civic Players were charged with overseeing and organizing restoration efforts, securing funding for them, as well as organizing volunteers and management of the day-to-day operations, events, and shows. Their history of support to the place they call "home" has helped make the Ramsdell Theatre the beautiful structure it is today. productions and opportunities to the community at large, as well as conducting workshops, studio productions, children's plays and student drama classes. Using local talent the MCP has presented over 300 stage productions including more than 125 musical shows.